The Deluxe Mattress Protectors are high quality, discreet and 100% all natural cotton material. They are soft, breathable, absorbent and waterproof – a great natural alternative to sweaty plastic undersheets. The undetectable layer of polyurethane makes these protectors 100% waterproof without the horrible feeling of lying on sweaty, rustling plastic sheets. The two layers of super-absorbent cotton fabric is bonded thermally with a breathable, waterproof polyurethane membrane sandwhiched between them. 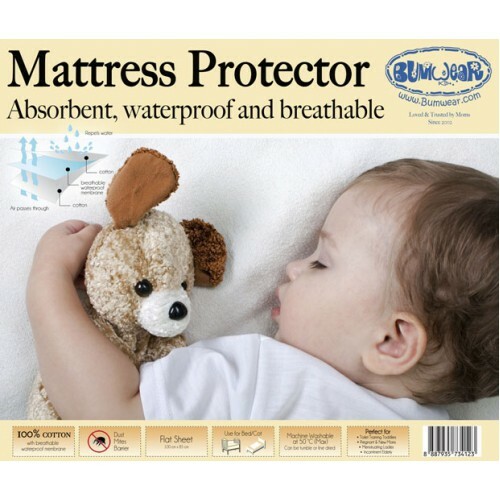 Water is absorbed quickly through the fabric with no seepage to the bed and no leakage, ensuring a good night's sleep for you and your little one. The same properties that make the layer of polyurethane 100% waterproof also make it an anti-allergy barrier. It protects against dust mites, a major cause of two increasingly common childhood conditions – asthma and hayfever. 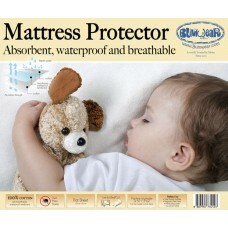 This flat sheet mattress protector is ideal for use for baby cots. It is wide enough for the sides to be tucked under the cot so that it is secure in its position. Note: We do recommend purchasing at least two mattress protectors for your home, so you have at least one ready to use while washing the other.